Avianca Brazil is slowing down expansion after quadrupling in size over the last four years. Avianca will again pursue faster domestic capacity expansion in 2014 than its three larger competitors as six additional A320s are delivered, replacing smaller Fokker 100s, but the rate of growth will slow significantly. Avianca Brazil now accounts for 8% of Brazil’s domestic market, up from only 2% four years ago and 5% two years ago. 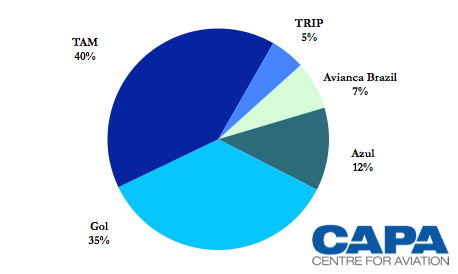 Gol, TAM and most recently Azul have all slowed down capacity growth while Avianca Brazil has continued to expand rapidly but from a small base. As Avianca Brazil’s domestic position could be approaching maturity, the airline will need to turn its attention to international market potential. Avianca Brazil remains purely a domestic carrier while TAM has a dominant position in Brazil’s international market, Gol is increasing its international focus and Azul has unveiled plans for a new long-haul operation. If Avianca Brazil is to maintain its relevance, an international move should be on the radar, particularly as it prepares to enter Star while the alliance also controversially continues to court rival Azul. Avianca Brazil is the fourth largest Brazilian carrier, flying 7.9% of total domestic RPKs in the first four months of 2014, according to Brazilian ANAC data. Avianca Brazil’s RPKs were up 26% year over year in the first four months of 2014, outstripping the industry average of 9% growth. ASKs were up 20%, surpassing an industry average of only 1% capacity growth. Notes: TRIP share listed separate in 2013 but combined under Azul in 2014. As a group the Azul share remained flat at 17%. Avianca Brazil remains the fastest growing Brazilian carrier by a wide margin. Gol’s ASKs were flat in the first four months of 2014 while TAM recorded a 3% decrease and the Azul group grew capacity by 6% (includes TRIP, which Azul acquired in 2012 and has now been fully integrated). All the carriers saw RPK growth as load factors improved at every airline – an encouraging sign for a market that has struggled over the last two years. But the rate of capacity growth at Avianca Brazil has been slowing. 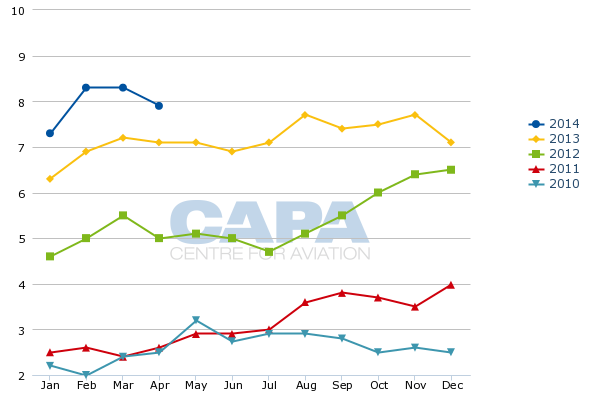 In Apr-2014 the carrier’s ASK growth was 14% year over year, the lowest monthly figure in four years. Avianca Brazil began its current expansion phase back in Mar-2010, when it took delivery of its first A320 family aircraft. It previously had an all Fokker 100 fleet consisting of only 14 aircraft. With the 14 aircraft Avianca Brazil was a small niche player, capturing only slightly more than a 2% share of the domestic market. 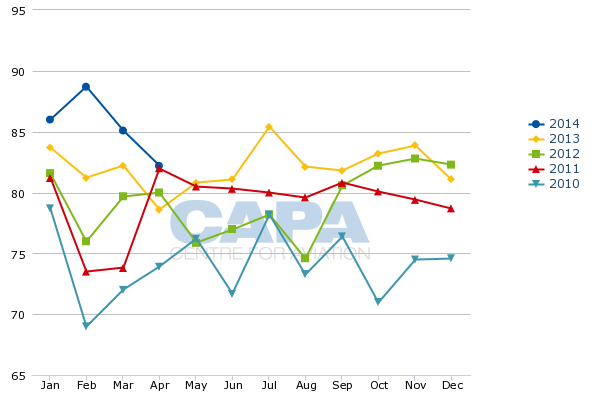 Its market share reached about 2.5% by the end of 2010 as ASKs for the year were up by 22%. In 2011 growth further accelerated, reaching 32% for the year as its market share (based on RPKs) surpassed 3%. 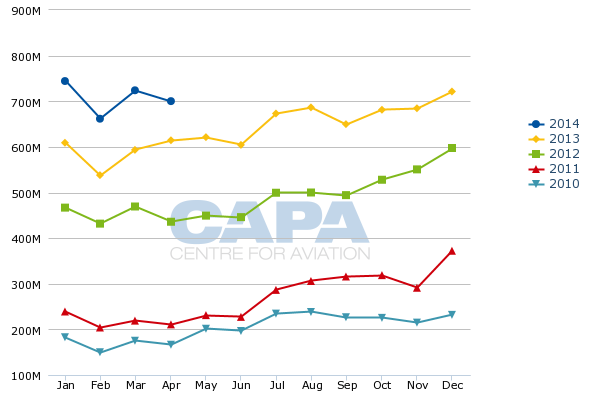 But it was 2012 when Avianca Brazil really accelerated, growing ASKs by 83% as its market share increased to over 5%. ASK growth slowed in 2013 to a more realistic 35%. Factoring in the slowdown in the overall Brazilian domestic market growth rate in 2013, to 2%, the growth from Avianca Brazil last year was still impressive. Avianca Brazil’s market share exceeded 7% for the first time as Gol and TAM shrunk. Avianca Brazil has continued to post the highest load factors in Brazil, giving it confidence to add more and more capacity in the market. Its load factor was up in 2010, 2011 and 2013 while in 2012 it was flat despite the 83% ASK growth. On a year over year basis Avianca Brazil’s load factor has been up 11 out of the last 12 months, reaching a record high of 89% in Feb-2014. But the carrier recognises the growth rates of the last few years cannot be sustained. While high load factors have been maintained yields in the Brazilian domestic market have been trending down. Avianca Brazil is privately owned (it is not part of Avianca Holdings, the parent company of its sister carriers in other Latin American countries which is listed in Bogota and New York). But yields and profits have likely been under pressure following the trends of publicly listed Gol and TAM. Mr Efromovich says Avianca Brazil took delivery of four additional A320s in the last two months but these aircraft will be used to replace Fokker 100s. He adds the carrier will receive only two additional aircraft, both A320s, in 2H2014 but again these aircraft will be used to replace Fokker 100s. According to the CAPA Fleet Database, Avianca Brazil now operates 12 A320s, including the four aircraft which were just delivered, four A319s and 15 A318s. The current number of units in the fleet is nearly triple what it had in early 2010. In terms of monthly ASKs capacity has grown more than four-fold over the last four years (Apr-2010 to Apr-2014) as most of the aircraft added have been larger and newer. Avianca Brazil is keen to retire its Fokker 100s as the type is becoming increasingly expensive to maintain due to the price of parts rising significantly. The carrier began phasing out some Fokker 100s in 2013 and says it currently has eight of the type remaining in service. Mr Efromovich says a retirement date for the last Fokker 100 has not yet been set and this could depend on market conditions. But given the dwindling numbers it would be logical for the last Fokker 100 to be phased out in 2015. Synergy initially acquired 29 Fokker 100s in 2005 from American Airlines, with 14 being handed to Avianca Brazil (then known as OceanAir) and 15 to Avianca in Colombia. The aircraft in Colombia were phased out in 2011. Synergy also is the largest shareholder in Avianca Holdings and is the company behind all of the group’s Airbus orders. Synergy's most recent orders include 18 additional A320s and 33 A320neos (placed in 2011) and nine A330s (placed in 2012). Synergy also placed an order for 10 A350s back in 2008. The A320 family aircraft have traditionally been allocated across the portfolio. The Avianca brand currently includes A320 bases in Brazil, Colombia, Ecuador, El Salvador and Peru. An allocation for 2015 has not yet been finalised but Mr Efromovich says some aircraft are needed as replacements in Colombia and some aircraft will again end up in Brazil. The group’s A330s are all in Colombia with the exception of two aircraft in Peru. The A350s have always been intended for Brazil while 15 787s are intended for the Colombian market with deliveries starting in Sep-2014. Avianca (rather than Synergy) initially placed an order with Boeing in 2007 for 10 787s and subsequently increased its commitment to 15 aircraft. Mr Efromovich says all 10 A350s are still intended for Avianca Brazil “in principle” but adds Synergy's A350 deliveries are now not slated to start until 2018, giving the group plenty of time to relook at the A350 deployment plans. Synergy decided to push back the delivery slots on the A350 as it decided market conditions in Brazil were not favourable for expansion into the long-haul market and that the aircraft were not needed in Colombia as the Colombian carrier is already receiving 787s. Long-haul expansion at Avianca Brazil has indeed always been viewed as a risky proposition and Mr Efromovich raised eyebrows in 2008 when he first stated he was ordering A350s for the Brazilian market. But the carrier now risks losing out strategically by continuing to focus entirely on the domestic market. Avianca rival LAN took a gigantic leap into the Brazilian international market in 2010 by forging a merger with TAM. The LAN-TAM merger in many respects was a response to the Synergy-led Avianca-TACA merger, which created a pan-Latin American group which was almost as big as LAN before LAN moved on TAM. A lack of a significant presence in South America’s largest international market, Brazil, is now an obvious white spot in the Avianca network. With TAM dominating Brazil’s international market there has always been a potential space for Avianca Brazil once it was ready to make a move, presumably with its A350s. But Azul has suddenly beaten Avianca Brazil to the punch and is now planning to become Brazil’s second widebody operator in late 2014, when it begins operating A330s (with A350s to follow in 2017). Azul’s upcoming launch of services to the US will make it difficult for Avianca to enter the Brazil-US market, which is the largest international market from Brazil. Avianca now only serves this market with one-stop services via Bogota and Lima, making it an insignificant player. Europe would also be an option but is a smaller and very competitive market. Avianca Brazil would likely need US routes to give a potential widebody operation sufficient scale but the Brazil-US market may not be able to support both Azul and Avianca Brazil over the long term. Avianca Brazil also has been slow to expand into the regional international market and dropped its only international service, Sao Paulo-Bogota, in 2012. There are opportunities for Avianca Brazil to use its existing A320 family fleet to expand internationally but it needs to act fast. Gol, which has no intentions of again operating widebodies after a failed attempt in 2008, is now pursuing regional international expansion with the goal of doubling its international portion of revenues to 17% by 2016. In the first four months of 2014 Gol accounted for 15% of the international RPKs flown by Brazilian carriers, with TAM accounting for the other 85%. Gol’s latest international expansion move is Santiago, a route dominated by LAN and TAM parent LATAM. Avianca Brazil could have made a move as LATAM was required to give up slots to new entrants on Santiago-Sao Paulo as a condition of its merger. But Gol and Chile’s second carrier Sky instead made the move, making it hard for Avianca to later enter this market. If Avianca Brazil does not make a move fast it also risks losing out to Azul in the regional international market as it has in the Brazil-US market. Azul has not yet started operating regional international services but could potentially use its existing E190 family fleet to serve Argentina and Uruguay (Azul has no intentions of acquiring A320s or 737s). Argentina is Brazil’s second largest international market after the US. Avianca now only serves the Brazilian international market using its affiliates in Colombia and Peru. The group has about 17,000 weekly international seats to and from Brazil, giving it only a 3% share of the total Brazilian international market. Operating to Argentina, Uruguay, Chile and potentially the smaller markets of Bolivia and Paraguay would also help the Star Alliance improve access in these markets. While 10 Star members from outside Latin America serve Sao Paulo, most do not serve other markets in the southern cone region of South America. Sao Paulo is a gateway for the southern cone of South America and domestic Brazil while other Latin American gateways such as Bogota and Lima are better placed to serve the northern part of South America. Avianca’s relatively small size in Brazil has become an issue with the Star Alliance, which is keen to grow its presence in Brazil after losing TAM to oneworld in Mar-2014. Star, which has had Colombia’s Avianca and its sister carriers in Peru and Central America as members since mid-2012, announced in Dec-2013 the approval of Avianca Brazil as a new member. The alliance believes Azul could add benefit even if Avianca Brazil also joins as a full member. 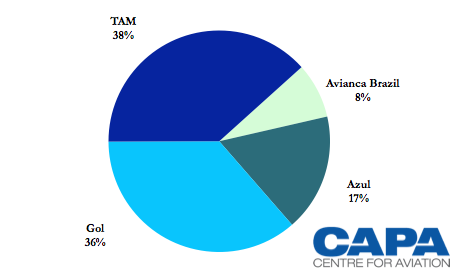 Azul and Avianca Brazil combined would not provide the coverage TAM is providing but Star sees the duo providing better coverage than relying entirely on Avianca Brazil, which only has a 7% share of the Brazilian domestic market. But some members of Star prefer not to offer an LCC partnership option, believing such a product could water down Star’s offering to passengers. These members believe LCCs should only be allowed in if they chose to become members and fully meet Star’s membership requirements. They think it is unfair for LCCs to enjoy a lot of the main benefits of membership, including feed, without having to invest in membership and meet the membership requirements. These members believe if an LCC does not want to join they should simply forge bilateral partnerships with Star members and not offer a special alternative platform. Avianca Brazil obviously would prefer to be the only Star member or affiliate in Brazil. But some carriers would prefer a dual solution with both Avianca Brazil and Azul. Star is continuing to court Azul, which recently began codesharing with Star founding member United. Avianca Brazil is seeking exclusivity which Star’s members understandably have so far been unwilling to give. Brazil is too big and too important of a market for Star to rely entirely on one relatively small carrier. Avianca Brazil is approaching a critical juncture. Over the past four years it has succeeded in carving out a meaningful niche in the Brazilian domestic market with a network covering most of the major trunk routes. The carrier now has the opportunity to join Star – potentially by the end of 2014 if it can accept non-exclusivity – which would significantly raise its profile and provide a global offline network. And in particular Avianca Brazil needs to make a decision on international expansion, something it has long talked about but has still not implemented. Strategically, now would be the time to make a move.